It's been another busy week and I'm wondering where all the time goes. A lot of it is taken up with looking after somebody or another...taking Mum to the doctor, rounding up Dad from his wandering trips, taking Guide Dog puppy Quentin to the vet and granddaughter Emily to pre-school, doing Mum and Dad's shopping...you get the picture. The juggling act sometimes feels greater than it did when I had small children of my own! But when I think like this, I remind myself how very lucky I am to be working from home - what now feels challenging might well be overwhelming or impossible if I was still in full-time employment. It's also a bit of a privilege to have a creative outlet and be able to call it work! I have managed to get some more images made for art licensing - that in itself feels like a massive step forward this week! 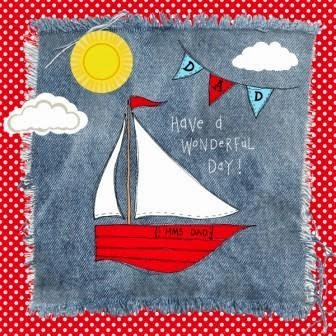 I chopped up some old jeans, washed the pieces to fray them, scanned them and then worked on incorporating the denim into images that might work for a greetings card. I like the feel of texture you get in what is essentially a flat digital image and maybe I'll do more along these lines (although that depends on what the agency thinks too - they've not seen these ones yet). Although I am very pleased to report I'm now featured on their front page! 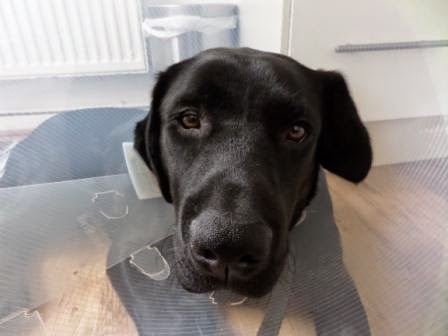 Quentin had his operation on Wednesday. 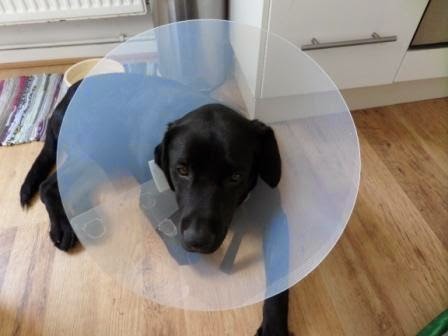 He's still wearing the lampshade-style collar to protect his stitches from his teeth! Poor boy. He's not allowed any off-lead running yet, which at first was OK but now he's starting to appear far too full of energy - all he wants is a good run and he can't understand why he's not being allowed off his lead. He's quite upset at being led past the grass instead of onto it! In these pictures, he was still groggy from the anaesthetic - possibly the quietest he's ever been! 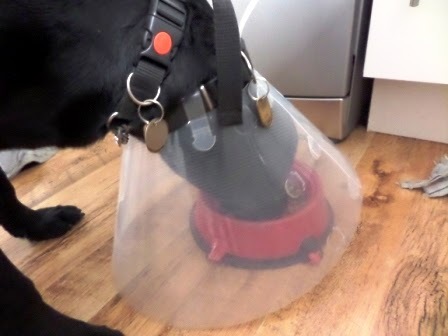 But he soon worked out how to eat his food with his big collar on! There's not much that will keep him from his food! What has your week been like? Join in with Handmade Monday and we can all pop over for a look. It's been a little while since I last checked in- and Quentin is growing fast! I love your new designs with the denim fabric. The owl design is so cute! I wish Quentin a speedy recovery. Wonderful creations. What a sweet dog. Its sounds like you have a lot on your plate. Its good to hear you're still finding time for your artwork though, I love your idea of using the denim, it really adds another dimension to the images. Dont forget when our kids were young....we were younger as well! Poor Quentin hope his stitches heal soon. 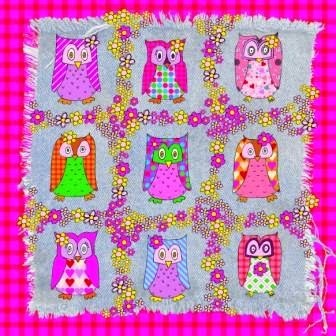 I love the denim effect for your owls. Hope Quentin is fully recovered soon.